Cooper: Would Ronald Reagan endorse you as president and why? Paul: What did you say? Oh right. I don’t know but Ronald Reagan campaigned for me in the 70s and he told me personally to mind the economy. ECONOMY! Huckabee (for the win): It would be presumptuous to answer that. I can’t say that Ronald Reagan would endorse me, but I wish that he would. Ronald Reagan was a great president, not because of his policies, but because he believed in this country and he rallied the great people of this nation to believe in America again. If we can recapture that, that’s when we can recapture the Reagan spirit and only then can we bring this divided nation back together again. Cooper: Thank you gentlemen and with three votes, Ron Paul, we believe you to be the mole, you are dismissed from the race. at theTRu you’ll see a new Left to Write, the start of the Year in Re:TRu and much more… and i’ll probably ask you some questions about what i do…. 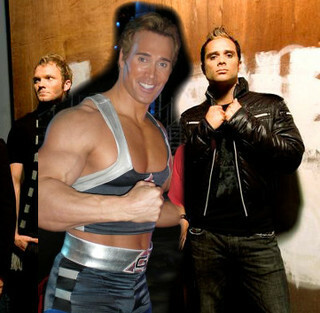 i mentioned a while back that Skillet has a new drummer now and i noticed that there’s a lot of Skillet fans…er, panheads out there looking for Skillet news… so here’s one for you… it seems to me that there will not be a new album from the group until John Cooper is done moonlighting as Titan, the captain of the new American Gladiators. . . Comments Off on is it really Thursday?